New techniques in cellular and molecular biology have increased our understanding of the mechanisms controlling reproductive function in the female. 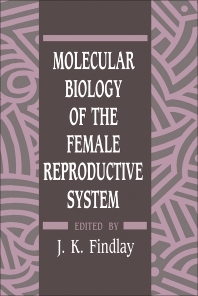 Emphasizing these new techniques, Molecular Biology of the Female Reproductive System provides a state-of-the-art review of local regulatory mechanisms that control reproductive processes. Stressing the interface of endocrinology, immunology, and cell biology, this book concentrates on the autocrine, paracrine, and endocrine systems that regulate both the functions of the ovary and uterus and the interaction between the early embryo and the mother. Contributors. Preface. Hormonal Control of Folliculogenesis and Luteiniation, S.G. Hillier. Control Systems of Theca-Interstitial Cells, D.A. Magoffin and G.F. Erickson. Growth Factor-Mediated Cell-Cell Interactions in the Ovary, M.K. Skinner and J.A. Parrott. Potential Relevance of Cytokines to Ovarian Physiology, E.Y. Adashi, E. Kokia and A. Hurwitz. Role of Insulin-like Growth Factors (IGF) and IGF Binding Proteins in Folliculogenesis, G.F. Erickson, A. Nakatani, X.-J. Liu, S. Shimasaki and N. Ling. Expression of Genes Encoding Steroidogenic Enzymes in the Ovary, M.M. Hinshelwood, M. Demeter-Arlotto, G.D. Means and E.R. Simpson. Molecular Biology of Endocrine Receptors in the Ovary, O.-K. Park-Sarge and K.E. Mayo. Molecular Mechanisms in Ovulation, A. Tsafriri and N. Dekel. Hormonal Control of Luteal Function, T.D. Braden, C.J. Belfiore and G.D. Niswender. Cell Biology of the Oviduct and Endometrium, L.A. Salamonsen and C.D. Nancarrow. Cell Biology of Migratory Cells in the Endometrium, D.A. Clark and E. Muzikova. Growth Factor and Cytokine Expression in the Endometrium, L.J. Murphy and G. Ballejo. Paracrine Interactions in Endometrial Function, M. Seppala and E.-M. Rutanen,. Molecular Biology of Trophectoderm and Placental Hormones, R.M. Roberts and R.V. Anthony. Index.